With a script a heady mix between Jim Cartwright's 'Two' and John Godber's 'Bouncers' (Tristan Bernays) but set in the post war decade of Teddy Boys and Rock N Roll, this is a duologue between a young Teddy Boy and Teddy Girl as they tell their own stories of living in Blitz-torn London to poor and broken families, and how they are saved by the music. They are separate stories at first but when they meet each other and their stories become one, the story takes on a Bonnie and Clyde-ish feel (with gender role reversal), until the inevitable happens which finally finds them both in prison and having to make the biggest decision of their lives. Combine this with a whole load of period music, played by actor-musicians on the side of the stage; the marvellous Johnny Valentine and The Broken Hearts, and this is quite a unique presentation which, thanks to some excellent acting skills, is extremely engaging. Teddy (George Parker) and Josie (Mollie Chesworth) played their roles for all they were worth, and switched from their own characters to those of the people they interacted with, with lightning speed, and then just as swiftly back again, with nothing more than a body position change or vocal change. Whilst I was unable to empathise with them - their situations being beyond my own experiences - it was not at all difficult to sympathise and I felt a lump in my throat a couple of times during act 2. Johnny (Dylan Wood) created a Vince Taylor-esque character for all the ladies to swoon to, and bopped his American hip-swaying way through tunes familiar and new, whilst more than ably aided along the way by Sammy 'The Sticks' Smith (Andrew Gallow), bass guitarist Jenny O'Malley (Freya Parks), and lead guitarist Buster Watson (Harrison White). The set (Max Dorey) was less than optimal, placing the band too far to one side of the stage, meaning they were not visible to any audience sitting on the left side seats. There was a simple composite set of a derelict buildings with corrugated iron wall and a 'Keep Out' sign served as the backdrop to all locations. This worked - just. However, what didn't work at all was the omnipresent and rather large disused AGA oven conspicuously centre stage, upstaging the scenes and action. 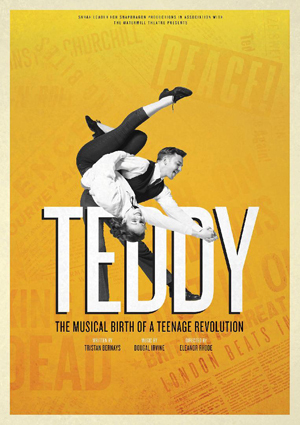 Subtitled, 'The Musical Birth of a Teenage Revolution', this ably places this piece of theatre probably better than I can, and gives audiences a fair idea of what to expect - young rebelliousness in both music and actuality. A very entertaining and engaging piece which although excellently crafted, fails to deliver that certain wow factor to make it a hit.